While you probably never thought about it, there actually is a correct way to mop a floor. Believe it or not, it works amazingly and will leave your floors looking fabulous over the course of time. The steps may seem a little bit daunting but once you get into the rhythm, the mopping will go by very quickly. Let’s take a look at some of the steps to go through in order to get the best shine and most long-lasting results when mopping a floor. Fill a bucket with warm water and solution: It is possible that this solution can be your favorite kind, from a store, or you can make your own solution, consisting of a mild soap, as well as a splash of vinegar for that real cleaning effect. 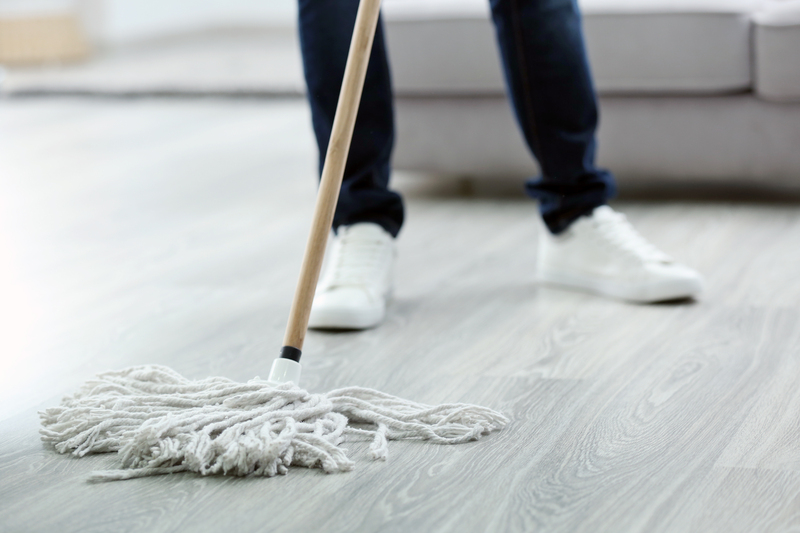 Get your mop: Contrary to recent reports, the cotton mop is still the route to go when cleaning a dirty floor. There are multiple reasons for this, including that it holds water and dirt, but also lets it go. You can then wash the top of the mop, which has been a huge innovation. By removing the top, you have the ability to throw it into the washing machine, or similarly, wash it by hand and let it air dry. Dip mop: Typically, you would think to dip the mop and then immediately wring the mop out, however, this is not the correct way to mop. You should be dipping the mop, holding it above the water for a second or two, and then proceeding to slather it onto the floor area, leaving a thick layer of liquid. By spreading the liquid all over the ground, you can let the solution do its work. Pickup: The final step to this process is going and wringing the mop out, then going over to the wet floor area and picking up the water with the partially dry mop. This will allow for the dirty water to be picked up. It is important to remember to only swish the dry mop around a few times before wringing it again to ensure that you pick up the water but also don’t pick the dirty water back down again. If you follow all of these steps, you are on the path to the perfect looking floor. The shine will be incredible, as well as the cleanliness. If you are looking to hire a cleaning service that mops while utilizing the best techniques in the business, contact us today by filling out our contact form or reach us directly by calling us at 508.788.9070.